It’s everywhere, the big money professional players are always necking a bottle of the latest sports drink. No wonder they drink endless bottles of the stuff – it’s provided to them free of charge by the sponsors, but for a regular amateur footballer, are there any benefits to buying these drinks? Lucozade sponsor the FA Premier League in England, Powerade are the official sponsor of the 2014 Brazil World Cup, and Gatorade sponsor a host of mainly non-football events. The sports drink industry is a multi-billion dollar industry and the makers of these drinks are have a vested interest in us believing that we need to be drinking their flavoured beverages if we want to unlock the athlete within. Don’t buy into all the hype without looking behind the advertising and understanding what sports drinks are all about. 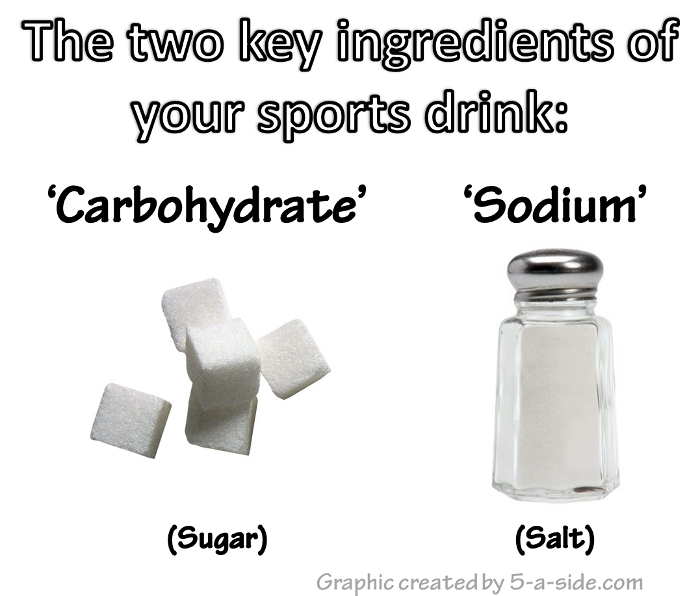 What Are the Ingredients of a Sports Drink? Carbohydrate is simply sugar, and is necessary in order to provide fuel for working muscles. It replaces your glycogen energy stores. Sodium is salt, and a small amount of this helps speed up re-hydration. It maintains your fluid balance and replaces the salts that are lost in sweating. Flavourings are what make the whole thing taste nice, unless you enjoy drinking water mixed with nothing but sugar and salt. Notice that nowhere on the list of key ingredients does it say ‘elixir of life’; ‘potion that will turn me into Lionel Messi’; or ‘way to get slim’. Next time you see one of the drinks companies’ expensive adverts you’ll know exactly what they’re trying to sell you, and that should help you take it with a pinch of salt, or should that be ‘sodium’. Although all sports drinks are some concoction of carbohydrate and sodium, the different brands combine them in slightly (or sometimes significantly) different quantities and it’s worth understanding the results. No doubt you’ll have heard the term ‘isotonic’ from the adverts that the drinks manufacturers throw at you. 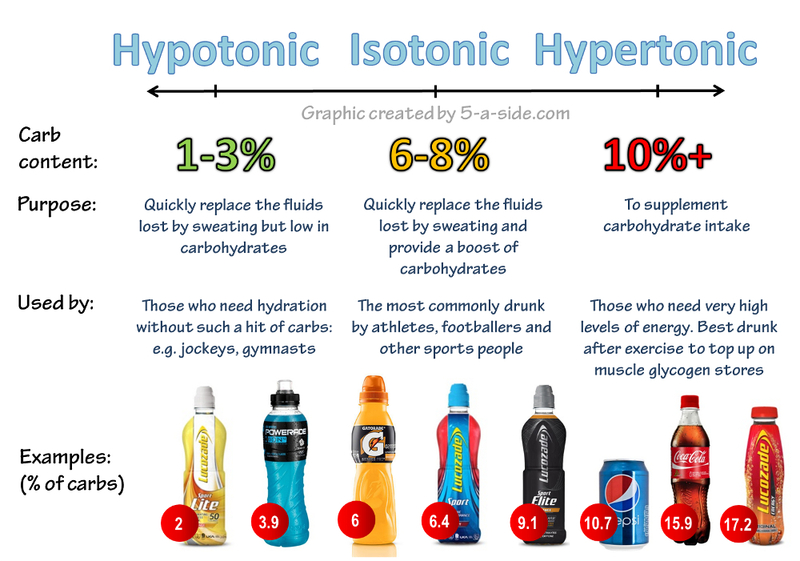 This is testament to the clever work of the advertising agencies; they’ve got us all running around thinking we need ‘isotonic’ drinks but few of us even know what that word actually means! If a sport drinks is isotonic it means that it contains similar concentrations of salt and sugar as in the human body. That seems like a sensible idea; you want to be drinking something that replaces fluid and gives you the same proportions of sugar and salt that that are in line with your body’s natural balance. There’s only so much sodium that you can add to a drink (and too much can be dangerous), so the noticeable difference between the different brands tends to be the level of sugar that’s added. It’s the level of sugar that is the main driver behind drinks being labelled hypotonic (which means that it contain a lower concentration of salt and sugar than the human body) or hypertonic (containing a higher concentration of salt and sugar than the human body). When you look at the difference in carbs (sugar) between each type of drink you might find this quite startling and maybe a little overwhelming – which of these is best to drink for football? If you’re not doing any exercise at all then drinking a sports drink is just adding extra calories. 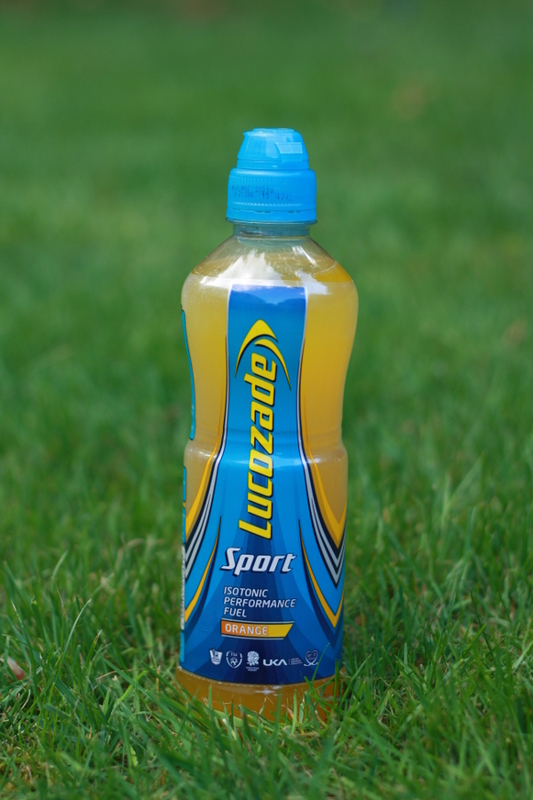 Lucozade Sport may be a very tasty drink to quaff in front of the television but be aware that it’s delivering you plenty of carbohydrate that you probably don’t need for static activity. Presumably that’s why it has been branded as ‘Sport’ and not as ‘Couch Potato’. Even if you are doing exercise, research indicates that if you’re doing shorter sessions, less than about 60 minutes, then you really shouldn’t need anything other than water. Worst of all, if you’re trying to lose weight then a sports drink could be counteracting the calories you’re burning playing football. If weight-loss is your goal and you do want to drink a sports drink then try to stick to the hypotonic drinks, which contain less sugar. Although for shorter sessions you don’t need a sports drink, there are circumstances where drinking one might be a good idea. Firstly, if you’re performing intense exercise that is going on for longer than 60-90 minutes, your muscles should benefit from the top-up of glycogen it gets from the sugars in a sports drink. The Journal of Applied Physiology found that consuming an isotonic sports drink increased treadmill running time to exhaustion by 27% in recreational runners (but bear in mind that a lot of these types of studies have been found to be flawed for the amateur athlete in one way or another). Secondly, if you’re going into a game without having eaten for a long while beforehand then an isotonic sports drink can give you a top-up of carbohydrate which should help top up the energy you’re lacking. It’s better to have had a properly planned meal in advance of your game, but on the odd occasions where you’re going into an evening game (say that game you have straight after work) and you haven’t had chance to eat anything other than a sandwich much earlier in the day, a sports drink is better than nothing. Hypertonic drinks, which contain more than 10% of sugar (e.g. a cola drink) are never suitable to be drunk during a game. Not only do they generally contain gas that makes them harder to drink, the high sugar content actually means they have a low gastric emptying rate, or in other words the body isn’t that effective at turning all that sugar into energy. But even hypertonic drinks might have a use under the right circumstances. After a very long session you might consider drinking one of these high sugar drinks to help replace your depleted energy reserves especially in the first 60 minutes or so after exercise in order to speed your recovery the most. This could equally be done by having a proper meal and drinking water but sometimes the situation doesn’t allow for it, so an sugary drink can be a viable second best. The most important thing is that you drink something! Drinking a sports drink can’t always give you an edge, but failure to drink enough fluid is guaranteed to impair your performance. Studies have shown that dehydration of just 2% of your body weight can have a large negative impact on performance. Make sure you drink enough before, during and after football to ensure that you’re hydrated going into the game and then replace any fluid lost through sweating. So even though a sports drink probably isn’t going to improve your performance in your 1 hour game of 5-a-side, if it means that you drink enough fluid before, during and after sport then having one might not be such a bad thing. Some of us prefer the convenience and taste of a sports drink over and above the alternatives and, if you’re happy paying the extra instead of filling a bottle with cheap squash and water, then don’t let anyone stop you drinking them. It’s really easy to make your own sports drink, and you can do just as good a job as the major manufacturers, probably even better! We’ve put together a guide to making your own sports drink with 6 simple recipes. I am a year 11 student studying Media Studies at GCSE. Our project consists of creating a product after research on the chosen product’s market. I have chosen to make a sports drink and have some questions to help my research. The name will be THIRSTADE and my motto “Cure the Thirst, Feel the Ade”, is this a good name and motto considering my primary audience is footballers and my secondary audience other sports players both aged 12-35? The branding will be a light blue liquid with a dark blue label and a red impact font on the label. The colour scheme will be a red font on light blue/dark blue liquid is this suitable? My adverts will have sports players (mainly footballers) advertising the product. All 3 adverts will be print media, 1 will be a billboard, 1 a bus stop poster and 1 will be an advert on a football stadium’s advertising board. Is this suitable? I hope you can respond and help me in my coursework. Thanks for your reply.. We would be happy to send you a sample of our product, we would really appreciate an honest review if you would be so kind.. Please email me your contact details and address to send it too? Please share them around and provide real feedback for us – we’re confident you will see a difference with our drinks, compared with other sugar laden energy drinks! We will of course keep you updated as to other availability..
I’ll drop you a quick email too..
A very informative and impartial write up of the isotonic sports drinks currently available and the differences in the ingredients of each.. I wanted to make you aware of ipro sport’s new Isotonic sports energy drink that has recently been launched and has an very healthy balance of carbs and sodium.. it has been developed by sports people, for sports people.. I was hoping you could include it in any future write ups or if you update this post at all.. Thanks for your consideration. Hi David, thanks for the reply. It’s always nice to see that there are new entrants to an already competitive sports drinks market. I’ve had a look at your products on your website http://www.iprosport.com/ and they look good. Where can we get them – are they available in the shops yet? Of course if you want to send us a few to try then we’d be happy to road test them for the site! 😉 Best of luck with these drinks – hope you have success.